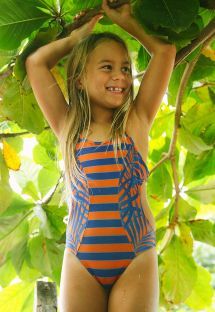 Even little girls know that swimwear should not just be girl swimwear. It's a statement of their personality and sense of fashion. 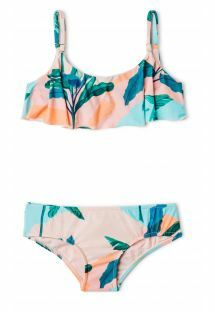 At Brazilianbikinishop.com, we carry an extensive line of girl swimwear, featuring cheerful designs they will love when they are out in the pool, at the beach or in your backyard. 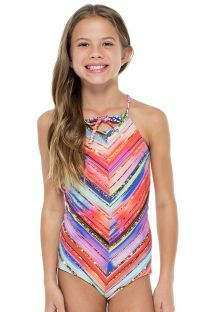 Our featured girl swimwear outfits showcase geometric designs, animal prints or multicolor modern graphics on premium fabric with Lycra. These one- or two-piece girl swimwear are lined, and some padding is used on the tops. A touch of fringe here, a dainty tie back there and subtle design features create stylish yet playful girl swimwear outfits to make your little princess proud. Little princess on the beach? Only in Brazilian Bikini Shop two-piece swimsuits! Great variety of colors and trendy prints plus the best quality and finest fabrics! Each little girl wants to look like her mom on the beach while teenage girls follow supermodels. So how to have that look while summer holidays? Get one of two-piece swimsuits for girls from Brazilian Bikini Shop! We provide great quality fabrics, mostly from South American brands and perfect finishing. These important characteristics will ensure comfort for girls and will last for sure more than one season! Girls can chose between different cuts and amazing colors. As well as for women we provide two-piece swimsuits for girls that reflect newest beachwear trends and tendencies in kids fashion. Now girls also have a choice between triangle tops, crop tops, bandeau and many other options. 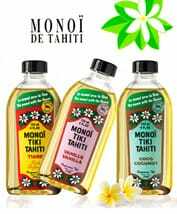 Our fabrics last long seasons, the vivid colors do not bleach and swimwear stay not transparent even after getting wet. They also dry fast, so that girl can enjoy comfort and have fun spending active days on the beach! Beautiful collection of one-piece swimsuits for girls! Top Brazilian brands, highest quality, fine fabrics and amazing prints that every girl will love! One-piece swimwear for girls is a perfect solution for every little princess at the beach. They are perfectly comfortable and allow girls to feel good and comfy while beach craziness. Swimming, running, playing games – everything comes easy in one-piece swimsuits for girls that you can get on Brazilian Bikini Shop! Our website provides great choice of cuts, colors and patterns. Rio de Sol and other South American brands know how to make swimsuits both: comfortable and pretty! Every girl will find prints and colors that she loves so that she can enjoy a day full of activity by the sea, ocean or poolside! 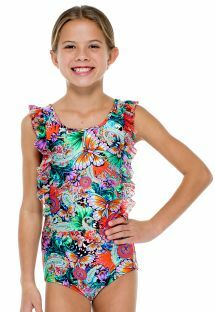 Pretty cuts and lovely prints will make her look like a little princess and one-piece cut ensures freedom and confidence. It is enough to add a beach skirt or shorts to leave the beach and walk on a seaside promenade or grab something to eat. Check it out! When you're looking for the most colorful girl swimwear on the market with the coolest designs, you'll definitely want to check out these pretty swimsuits. Girl swimwear should be both fun and functional.